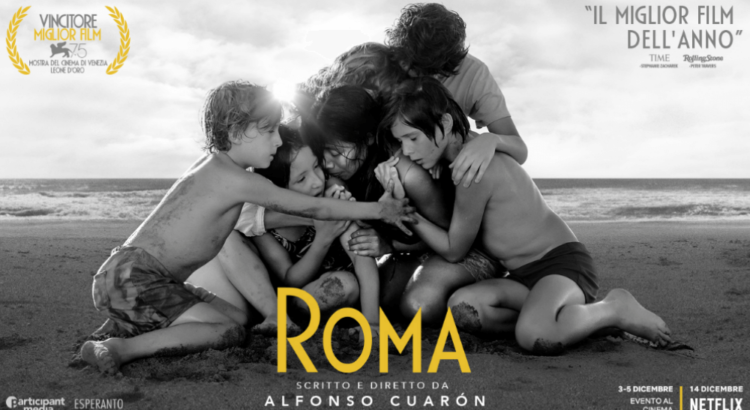 Roma, a film directed, produced, co-edited and shot by Alfonso Cuarón, is a semi-autobiographical film set in 1970-1971. It follows the life of Cleo, a maid to a middle-class family in Mexico City. Roma was originally aired– and is currently still being screened– on Netflix, where it got rave reviews. Select theaters, such as the Michigan Theater, showed the film in theaters. As someone who has watched the film both on my laptop screen and on the big screen, I can attest to the fact that one receives a very different film-watching experience depending on which setting it is enjoyed in. While seeing Roma on a smaller screen makes it no less creative or artistic in its story or message, the scope of its beauty and intensity widens, as sound and images envelop the viewer in a more immersive experience. The film is completely in black-and-white, and in Spanish with English subtitles. Immediately, though there is no actual use of color in it, the film manages to paint a detailed picture of the affections, tensions, and family dynamics that exist within the household that Cleo works in. Life in Mexico City, as presented in the film, is rich with life and sound; I immediately could sense the energetic and animated spirit of the city through the sights and sounds of its people and animals. From the beginning of the film, Cleo is the character to whom one is immediately drawn to; she is the center of the narrative, and holds a gravitational force over the other characters in the film as caretaker, provider, source of emotional fulfillment– though her quiet presence means that they may not be aware of that dependence. More than the star of the film, Cleo is a very interesting and nuanced character: though she barely speaks above a whisper, never betrays a hint of anger or frustration, yet her quiet gravity and strength are tangible. The martial arts scene, when she is the only person in a field of people who is able to form an intricate balancing pose– though no one takes notice– serves to illustrate the ways in which her restraint actually is a way of showing her restrained power. Cleo endures many hardships, both before and during the film’s setting occurs; a diasporic past and rocky relationship with her mother is hinted at, and during the extent of the film she loses several other loved ones. Again and again, we see Cleo abandoned and left alone; in most scenes she may be surrounded by those who claim to love and treasure her, but ultimately she is abandoned. In her darkest moments of agony and sorrow, the people she depended on in that moment leave her to her own devices. For instance, in the scene where Fernin abandons her at the cinema to finish the movie on her own, we are given a view of the screen of the film that Cleo herself is watching, and the scene is drawn out so long that we finish the movie with her. In other similar situations, the director chose to extend the scene and stretch it out for an almost uncomfortable amount of time. This particular decision, in my mind, was made to force the readers to sit with Cleo in her silence for a while so that they can temporarily embody the stillness and the waiting that characterizes so much of her life, and to reflect upon the implicit ideas or emotions that these scenes provoke. One of these subtle ideas is the notion of strength and bravery as being traits not only exemplified by showy acts or performative expression, but that can also be found in quiet reservedness. Cleo is the prime example of this; one cannot help but note the tenacious resolve in her impassive, but determinedly expressionless, face as she watches devastation and destruction happen around her in scenes such as in the hospital baby unit and in the forest fire. As the film continues, the more surreal and abstract images and concepts that are hinted at at its introduction are expanded upon and incorporated into the meat of the film. Scenes of destruction and violence are superimposed on ones that are canonically joyful, such as birthing a child or looking at newborn children in the hospital ward. At first, the surreal elements caught me off guard, as I had assumed that this film would be more documentary-like in its telling. However, once I realized that this film is more on the artistic side, the various images and recurring metaphors– as well as the slightly exaggerated actions and personalities of some characters– began to work together to make the film a lot more interesting. Before coming to see this film, I had already heard very positive reviews about it. The amount of artistry and creativity in this film was a lot more than I had anticipated, so I was pleasantly surprised when the film made more of an impression of an art film than a documentary. There are so many beautiful images and ideas that are explored throughout the film, and I am glad that several of my friends watched this film so that I can talk to them about specific scenes and metaphors that I cannot do in this post, as I don’t want to spoil any part of the plot for our readers. If you are able to catch a viewing of Roma on the small or big screen, defiantly take that opportunity. The film is a beautiful exploration of strength and beauty in the seemingly mundane, and a brilliant depiction of the various ways in which human relationships have the capacity to love and to destroy. On Monday October 15, The Immortal Life of Henrietta Lacks will be screened at UH South, hosted by Michigan Medicine. The film tells the story of the African American woman whose cells were used by scientists to create the first immortal human cell line in the 1950’s, and addresses topics such as racial and class structures that contribute to disparities within the field of health. There will be an after-film discussion panel on the topic of diversity, equity, and inclusion. Doors open at 6:30 and the film starts at 7:00. Sometimes, when I walk into Walgreens or stand in the checkout line at Target, I glance at my image on the tiny surveillance monitor, a fuzzy pixelated version of myself, and give it a little wave. Most of us don’t even think about what happens to our images once we leave the store. But who is sitting on the other side of the screen? I first heard about Dragonfly Eyes (2017) via Facebook. A quick Google search yields the synopsis: “A plain-faced woman leaves her training at a Buddhist temple to work on a dairy farm.” As if this summary was not interesting all on its own, more investigating led me to discover that this film is composed entirely of various clips of surveillance footage from all across the time and space of modern China to tell the fictional story of two doomed lovers, Qing Ting and Ke Fan. Director Xu Bing writes, at the beginning of the film, that he has had the idea of creating this type of experimental film since 2013, and the release of tons of footage in 2015 allowed him to turn his dream into a reality. Dragonfly Eyes is not only a new type of artistic film, but a commentary on modern Chinese society. Clips of natural disasters, such as violent car crashes and toppling buildings, are layered with intimate clips of people going about their daily lives, from a woman munching on some toast while lying in bed to a man sitting shirtless in his room, gaze fixed on his computer screen. The basic plot follows Qing Ting, a simple woman from a monastery, who leaves her safe haven to work at a dairy farm where she meets Ke Fan, a man who insists that she is different from all the other women he has ever met and pursues her with a sweet doggedness. The two of them become a couple, but Qing Ting refuses to give herself fully to him, insisting on paying for her own lifestyle and needs. After getting into trouble while trying to enact revenge on a rich woman who is responsible for getting Qing Ting fired from her job at the laundromat, Ke Fan is thrown into jail for several years. 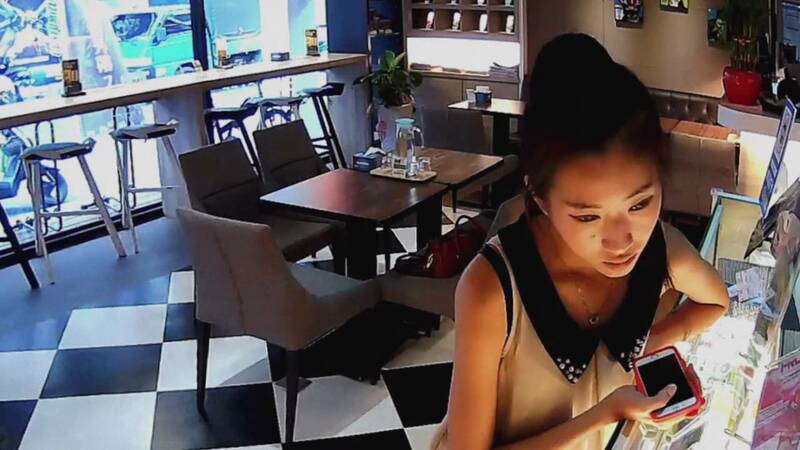 When he is released, he is consumed by the desperate drive to find his one true love, and he eventually succeeds, though she has transformed to become almost unrecognizable: Qing Ting was unable to find work with her plain face, so she underwent radical plastic surgery and became an internet star. The rest of the film follows his mad chase and his eventual spiral into a sort of madness. I will not spoil the ending, but it is definitely not what I was expecting. The creepiness and the horror aspects of the film creep up on you slowly, slow enough that they are almost casually normalized, and once the film ends you realize how deep the plot has dragged you into another frame of mind. I will admit that at the beginning of the film I was a bit skeptical; being unable to pair a face to the character was frustrating, and made me feel disconnected from the plot. The random insertions of clips of natural disasters and fatalistic events also confused me. However, as the plot progressed, the characters came into sharper focus. Perhaps this was the intention, to start from an expansive, general point of view, and to eventually narrow in, to zoom in, to focus like a camera lens, much like the nature of a surveillance camera searching for a certain person or object. If there is one critique I would make, it is that I believe that the film could have been fine– better, even– without the repeated insertions of dramatically horrible events: drownings, burnings, crashes. I think that the more intimate clips of daily life in China were more impactful. In addition, some of the clips felt a bit exploitative, particularly the ones that showed very graphic scenes such as beatings and suicides. Either way, just knowing that these film clips are all real makes the film so much more impactful. I’m awed at the dedication and time it must have taken Xu Bing to sort through the hours and hours of footage. Despite my skepticism and obliviousness upon the beginning of the film, Dragonfly Eyes has honestly become my favorite film of all time. I have never experienced anything like it, and I thought that the nature of the film, the way it had a creeping, slow-burn effect on the viewer, made it much more visceral and humanlike than anything else I have ever watched. I am convinced that Xu Bing is a sort of genius. If you ever have the chance to watch this film, I highly recommend that you do so. “Jane,” or “꿈의 제인”, is the second-to-last installment of the Nam Center’s film series, Korean Cinema NOW, and also a film that left a good majority of its audience in a state of enchantment, wonder, contemplation, and, most prevalently, confusion. Whatever preconception you may have about the film is probably wrong. I went in with only the barest sense of the movie’s premise, and yet I had already formed a vague idea about what the film might include: as an indie movie screened at the Busan film festival, I was expecting a cinematic, warmhearted movie with occasional moments of lighthearted humor, cozy familial dynamics between its characters, a social commentary neatly packaged into two artful hours. However, this film defied all of those expectations. It lingers with you long after the credits start rolling, and has an almost-unsettling effect. Interestingly enough, “Jane” does actually include those aforementioned elements, but it also has so, so much more. For starters, the movie’s winding, non-linear plot is extremely hard to pin down; the narrative initially seems concrete enough, but viewers gradually begin to realize that the certain events, symbols, and images are repeated in different settings and contexts, and the dream-like side of the film begins to take hold. After a while, viewers are unable to discern the ‘dream’ from reality, something that the film’s director, Cho Hyun-Hoon, ensured was an intentional effect. Something to note is that the literal translation of “꿈의 제인” is “Dream of Jane”. 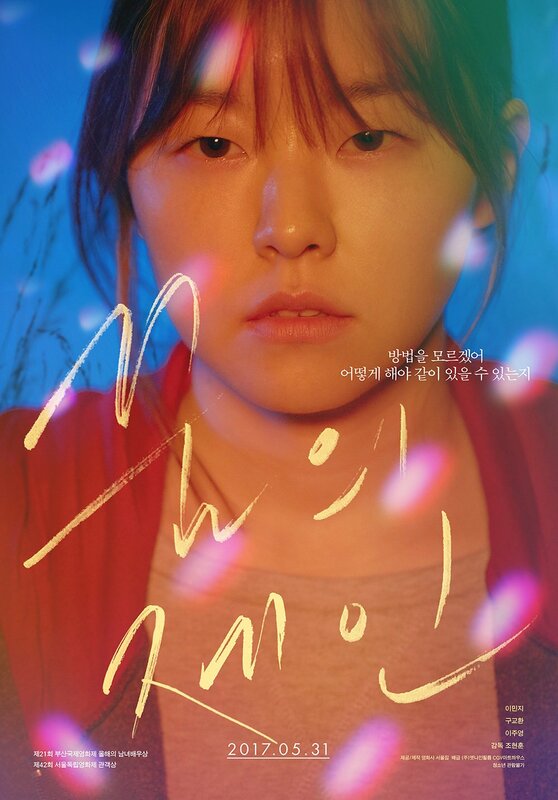 My initial conception of the film was that Sohyun, the protagonist, through Jane’s guidance, would find peace with herself while also discovering aspects of Jane’s past and dreams for the future. However, as the film unwound and became more convoluted, I began to wonder if “Dream of Jane” is less of the ‘Jane’s Dream’ interpretation than it is of ‘Jane is the Dream’. Because as the plot unfolded, I became more aware of the protagonist, and the film begins to narrow in on her psyche, becoming more of a psychological study than a feel-good movie (opposite to my expectations.) The unsettling ways in which Sohyun manipulates the people in her life to fit her narrative, or for her personal uses, all with a blameless, unassuming face, forces the viewer to take a step back and try and separate fiction from reality, and realize with dawning awareness that she is not to be trusted. “Jane” is not, in fact, about Jane at all; instead, it is a film about a lonely, manipulative girl with abandonment issues, and how she is able to mesh together fiction and reality so cohesively that even the audience is unable to see the truth. From a socio-cultural perspective, I thought it was interesting how the film addressed topics that are taboo in South Korean culture, such as eating disorders, mental illness, and suicide. However, I was significantly disappointed with the way Jane was portrayed. I think that transgender rights and experiences in South Korea are issues that had so much potential for exploration, and I was let down by how the film focused more on Sohyun and her narrative. I am still trying to decide if the director made Jane a transgender character in order to reduce her unconventional identity to some sort of metaphor or plot device (because her lived experience as a South Korean transgender woman is never really outrightly addressed or mentioned at all), or not. Plot-wise, I am still very confused about the logistical timeline of events. I am also unsure about the actual nature of the “business” the group is conducting, and the true nature of Jung-ho and Sohyun’s relationship. But most importantly, where does the dream end, and where did it begin? I would love to talk to someone about these questions; if you managed to catch the screening of this film, please drop a comment down below! 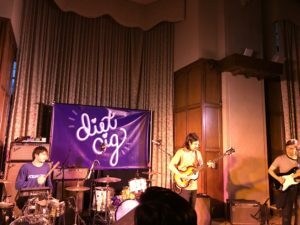 The Rogel Ballroom in the Michigan Union was transformed on Wednesday night into a colorfully-lit, almost unrecognizable concert venue in preparation for the Diet Cig and Palm concert, as brought by New Beat Happening, a student organization committed to bringing various musical acts to campus. I was excited for this concert, especially because I was familiar with Diet Cig’s music beforehand. While not a devoted fan, I do have some favorite songs by them, including “Harvard” and “Maid of the Mist.” I was not familiar with Palm before the concert, though I did some research on them in advance and found a song or two that I also enjoyed. Palm took to the stage first, immediately launching into their first song without any preamble. If there is anything to be said about their performance, it is the hypnotic, almost lullaby-esque, element that is maintained throughout. The songs blended into each other (the band had no pauses or gaps between their songs, maintaining a constant hum of sound, be it a droning bass or a steady drum beat as they set up for the next track), having the final effect of a long, monotonous stream of music that was punctuated by the occasional guitar riff or a faster scatter of drumbeats. The members did not really look at each other; they were very disconnected in that aspect. 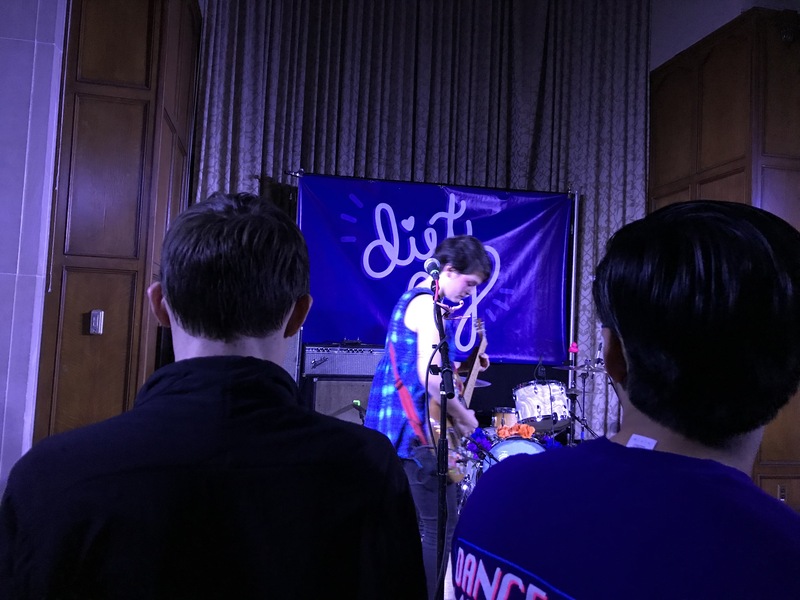 Instead, they all seemed more focused on the music, and would dip in and out of the melody with their contributions of guitar, drum, and bass notes, with the occasional discernible stream of lyrics. In all honesty, their music was not really to my taste; however, I heard some very positive reviews from the people surrounding me, so perhaps mine is just a minority opinion. 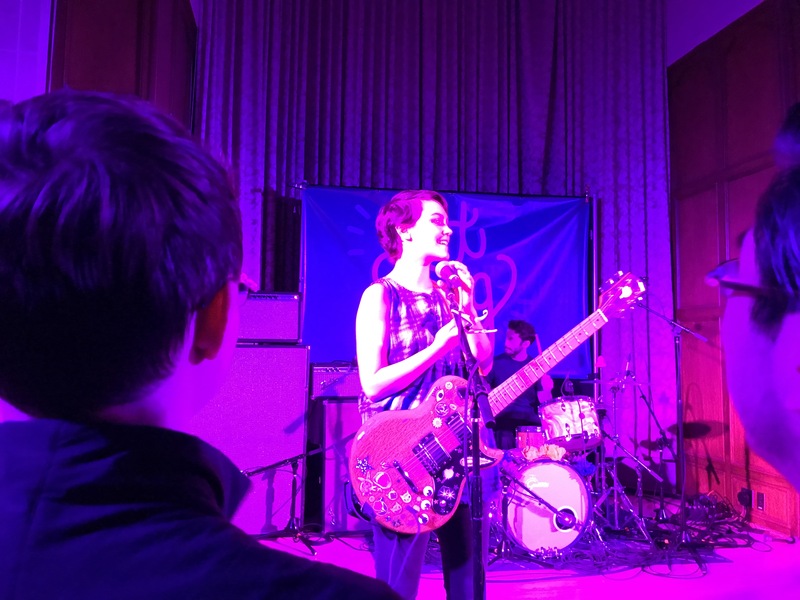 In regards to the people attending the show, a nice crowd began to form as time went on, and only swelled in size as time came closer to Diet Cig’s performance. I spotted at least two girls with glitter on their cheekbones (one of the trademark aesthetic elements of Diet Cig) and a plethora of band shirts. Everyone seemed to be in a generally pleasant and excited mood for a Wednesday night, but that could also be because of their excitement and passion for music, which was palpable. To my left, a group of people were discussing different guitar models and brands of equipment, and behind me a pair was dissecting Palm’s performance into its various musical elements. It was really cool to be able to be surrounded by people with such tangible interest in music. The crowd’s energy was kicked into overdrive as soon as Diet Cig (Alex Luciano and Noah Bowman) hit the stage. I heard more than one comment on Alex being like a fairy!, perhaps in regards to her short-cropped hair, infectious energy, the glitter smeared across her cheeks, her high-pitched voice, or some combination of all. Alex’s enthusiasm was so powerful and noticeable, radically different from the opening act, who hardly spoke to the crowd at all. In contrast, Alex interacted very openly with the crowd from the beginning, immediately letting everyone know that the show was a safe space, and addressed the importance of safety and consent during their performance, as well as where to find the people to talk to if you didn’t feel safe. As I stated before, I was excited to see Diet Cig perform, as were the people surrounding me. There was lots of dancing and shouting, and Alex fed off of the energy; she not only sang each song with as much fervor and spirit as possible, she also danced, bounced, spun, and kicked her way across the stage. What makes Diet Cig’s music interesting is its way of addressing serious topics about interpersonal and personal relationships in a way that has the capacity to be both angry and joyful at once. I am happy to note that my two favorite songs were played. I had a nice time, and am really grateful for New Beat Happening for arranging the show. I look forward to future events hosted by them.